Princess Jellyfish has been named one of 2016's "50 BEST BOOKS FOR TEENS" by the New York Public Library. Explaining the pick, Chantelle Uzan, an NYPL librarian, called Princess Jellyfish a “great introduction to manga, and wonderful for reluctant readers!” Her colleague Katrina Ortega added, “The characters are so unique and not characters that are commonly found in YA reading; even so, their fears and doubts and passions are all relatable, no matter your age.” Here's our official press release. 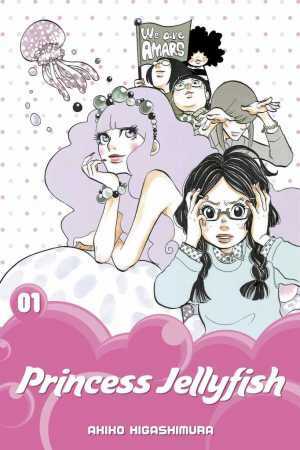 Earlier this month, Princess Jellyfish had also been named as one of Amazon's Best Comics and Graphic Novels of 2016. Only 20 books made the list, out of all graphic novels published this past year, and Princess Jellyfish was one of only two manga (the other being Shigeru Mizuki's The Birth of Kitaro). Here's our exclusive interview with Akiko Higashimura, which ran on this site in June. And If you haven't checked it out already, here's all of Chapter 1 to get you started!